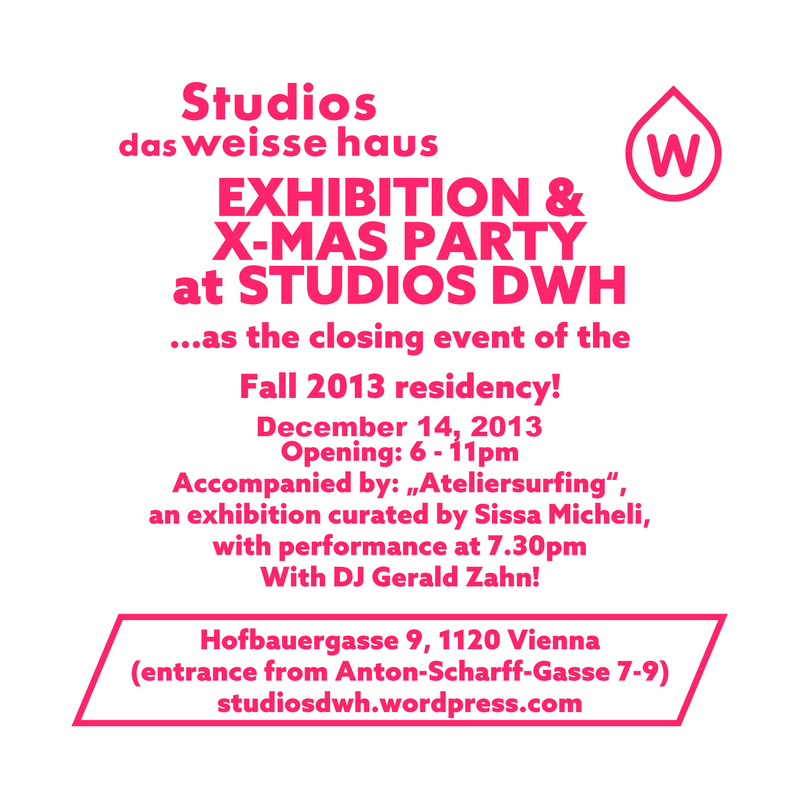 The Fall 2013 residency period is slowly approaching the end and therefore it`s time to announce its great closing event and invite all of you to the EXHIBITION & X-MAS PARTY at studios das weisse haus!!! Our Artists in Residence, Cécile Ibarra, Mirko Lazović and Tomáš Moravec are going to display the final presentations of the projects they were working on during their residency and the local artists will join them as well to present their current works. The show is taking place in the imposing space of the factory halls connected to our studio building and we`re happy to inaugurate them within this event!! Luis Casanova, Iris Dittler, Dejan Dukic, Romana Egartner, Daniel Ferstl, Michael Heindl, Juliana Herrero, Cécile Ibarra (AIR), James Kinsella, Larissa Kopp, Lisbeth Kovačič, Mirko Lazović (AIR), Alfred Lenz, Sissi Makovec, Sissa Micheli, Tomáš Moravec (AIR), Andrea Ressi, Anna Schmoll, Angela Strohberger, Christina Tsilidis, Sebastian Vonderau, Christian Weidner, Christina Werner and Natalia Zaluska. This great exhibition will be accompanied by a show entitled “Ateliersurfing”, curated by Sissa Micheli in the space of her own studio, with performance at 7.30pm. With Gino Alberti, Letizia Werth, Sissa Micheli, casaluce-geiger, Anke Armandi, Linda Reif, Diego Mosca, Caroline Heider, Irene Hopfgartner. With DJ Gerald Zahn and Christmas style hot drinks !!! We`re very much looking forward to your visit. « One day TRIP to BRATISLAVA full of great visits!